As y’all know we have recently been putting together our home, which means I have been discovering some new great things that I love having in our house. 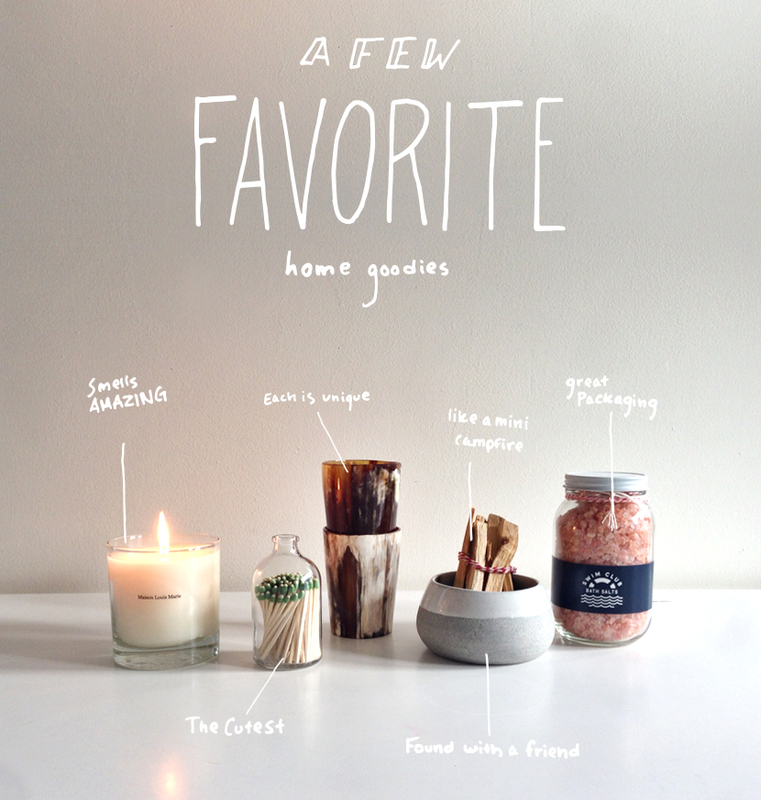 Whether they are just super cute or they smell amazing I love each one of these above items. Today, I wanted to show a few items we recently have added to our home and are really loving! I snapped a quick pic with my phone before I headed to the airport today so I could share them y’all. I love everything here so much I cannot even explain. I think your home should always be filled with things that you love and are inspired by. The Candle: I discovered this candle at JM Drygoods in Austin during our trip and since then I have purchased three more. It has officially become the scent of our home. Currently Clyde Oak is now carrying them online. The price is a little more than an Anthro candle, but this candle burns perfectly, it smells clean and like the earth, and the best part is it is classically beautiful. We get so many compliments on it and it just calms me when it burns. I am in love with the story and experience of the Maison Louis Marie Candles. Check them out. Matchstick Jar: Is there anything cuter than matches in a small jar? I simply just find this adorable and it looks so great in small arrangements in the house. I love matches and always find them so cool looking, but then add a reclaimed apothecary jar with a striker hidden on the bottom, and you have me sold. It is a small but fun detail to have around. Bull Horn Tumblers: These beauties are each unique and are from one my new favorite shops, Rose and Fitzgerald. What I love about the tumblers is how these look on our bar and how each one is unique. It helps create a hand crafted feel to our drinking experience. I cannot wait to share more about them, but this company is headed up by Courtney Poole who lives in Uganda and has all products sourced there. I highly suggest checking out the video behind their company. I love to hear stories like hers and in fact it is what drives so much of what we are passionate about at Wild Measure. Palo Santo Wood Sticks: These guys are pretty amazing. I love things that bring the outdoors in and these sticks are super special and bring that full experience to us while hanging at home. They are similar to incense but they are even cooler because they do not continually burn, so you burn them and let them simmer out. We joke it feels like a mini campfire in the house when we light them. It has an amazing smell and makes us feel slightly earthier than we are. You can find them at Imogene and Willie and other home stores. Read more about them here. A Small Pot: Found this little pot at Spartan Shop in Austin, I couldn’t not bring it home with me. I have not chosen a plant for it yet, but I am pretty crazy about how it looks with various items placed inside of it. Bath Salts: When we were doing our cleanse with Claire of Vidya Cleanse we were told to enjoy warms baths with salts. These Himalayan salts from Swim Club not only look really great sitting on the self in our bathroom but work incredibly well. Mike gave them to me for Christmas and I felt pretty spoiled as I have eyed the packaging for a little while now. You can see more of the things I love from Etsy here. Are there any great items you have picked up lately for your home that you love? I love finding new items like these to bring character and conversation in to our space. I hope y’all are having an awesome week thus far and staying warm! Omg that “mini campfire” is adorable!! Have been looking for a candle to replace my old one, which was quite expensive. I don’t want a scent that’s overpowering but I’ve had a couple of bad experiences with candles where you could only smell the scent if you’d sniff them up close. Do you notice the scent when you walk into the room? Thanks and lovely post, btw (also really enjoyed your 27th birthday post!). those matchsticks are cute! i’ve been on the hunt for the perfect ones… reaaallly wishing i could stumble up some vintage ones in cute matchbooks. thanks for sharing these!